By David Rodnitzky on 04/05/2011 in "Analytics Blogs"
A few weeks ago I criticized Meltwater Reach for trying to poach one of our clients with some questionable keyword research. Today, my teammate Orlee discovered an ad (in Gmail, I think) so incredibly inept that no sane person could fault Meltwater or any other agency for going after this business. 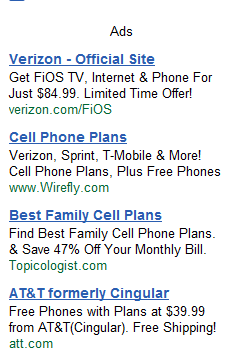 So here’s the ad, keep in mind that AT&T acquired Cingular in 2004. Note: unlike other agencies, we didn’t click on the ad to verify whether this really goes to AT&T. I have no reason to believe otherwise though. One Response to Cingular. Really? Hello davidzhawk, interesting site you have, and since it is in a similar area my own site I thought it may be useful to add some brief information about CPA marketing which I believe your readers would find helpful. CPA Marketing is where you target your site or blog visitors to specific offers that your visitors can normally sign up for free of charge. You get commission for the \”Action\” which your readers fill in; like filling in an email address or zip code, or downloading a some free software. Your readers do not have to do much at all for you to get revenue from your offers. This is the best reason of all for making your own CPA business. Your clients, your readers, do not need to purchase anything from you,in order for you to make money. They only need to sign into a site, or fill in their email address, or opt-in to receive a free gift.